Bean and Fritos Burgers were one of our favorite items on the menu at EZ’s, a restaurant based out of San Antonio. Unfortunately, they are no longer in the DFW area. As a result of their disappearance, I have tried to recreate a similar sandwich-a delicious hamburger topped with refried black beans, Cheddar, Fritos, onions and picante sauce. You drive with anticipation to your favorite restaurant only to find a “gone out of business” sign on the door. A few years ago, we drove to Dallas (about 45 minutes away) to eat at one of our favorite restaurants. It was a 50’s style diner called EZ’s. When we drove up, we observed the building was GONE and replaced with a convenience store. In shock and dismay, we drove around the block looking for it as if somebody had rearranged the neighborhood without telling us. Recreating EZ’s World Famous Bean Burger is one of my culinary obsessions. The interesting blend of textures and flavors make their world-famous bean burger unique and memorable. They are a treat well worth a few extra jumping jacks! These are messy but worth it. These famous hamburgers are a little tricky to eat. The beans are refried which means they are squishy and may “drip” when you take a bite. The Fritos sprinkled on top require a fairly large mouth to get a taste of everything in one go. Thick, juicy burger + cheese + garlic-y refried beans + + the crunchy saltiness of the Fritos + a fresh hamburger bun = HAMBURGER ECSTASY!! You can go several ways. I like to add shredded cheese to the hamburger meat before making into patties. 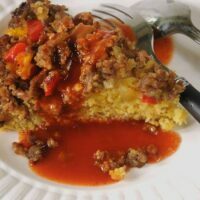 You could also try slices of cheese melted on top or a small amount of processed American cheese poured over the cooked burgers. The latter would probably be your favorite if you favor gooey nachos like those sold at the ballpark. 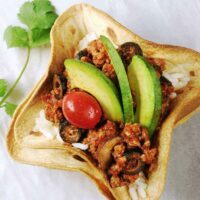 We love to add avocado slices or guacamole. In addition, some people add onions, but not me. A tomato slice or picante sauce would be good but honestly, this sandwich is pretty thick already, so it gets even messier if you go overboard on the extras. 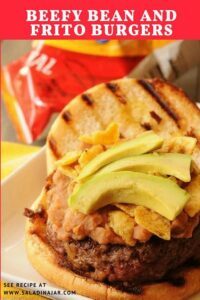 Hamburgers topped with refried beans, Fritos and avocados in the same style as once served at EZ's. Season ground chuck with salt and pepper. Lightly mix in cheese. Form meat into 4 balls. Flatten into patties and make depression in the middle with fingers. Lay on hot grill with depression up. Cook for 3-4 minutes. Do not flatten with spatula. Turn patties and cook until done. Grill or toast hamburger buns. Place meat patty on top of bottom bun. 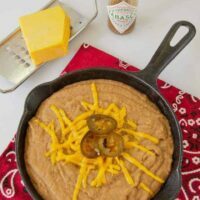 Spread a generous tablespoon of warmed refried beans on top of burger. Sprinkle a handful of crumbled chips on top of beans. If using avocados or guacamole, place on top of beans and Fritos. Replace top bun and lightly press down to squish toppings together for easier eating. Simple refried beans are cooked in the Instant Pot with no pre-soaking required. 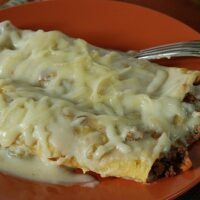 Green Chili Enchiladas are corn tortillas stuffed with ground beef, onions and Monterrey Jack cheese, then smothered in green chili sauce. Sills bean burger has reoepned by Brian Sills next door to the Magic Time Machiene On 410 in San Antonio. Brian is the original owners grandson. DELICIOUS!!!! I have eaten there a few times, did not notice this burger though, so I am glad you have recreated it. 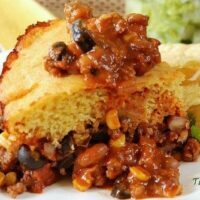 Sounds like a perfect cross between tex-mex and americana. Chris Madrid’s in San Antonio has a tostado burger that sounds a lot like this. I moved away from San Antonio but try to go to Chris Madrid’s when I get back there. We are going to the San Antonio area later this month. Will try to find a Chris Madrid’s. Thanks for the tip. Yes, EZ’s is still open in San Antonio. The original bean burger was created by a mom and pop team who owned the Sill’s Snack Shack back in the 60’s. 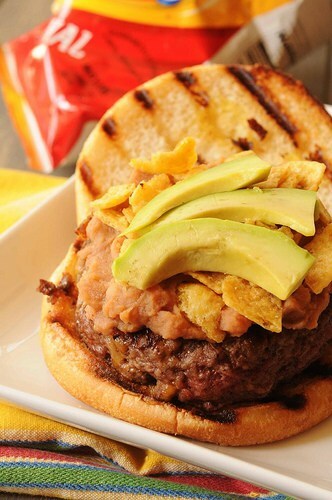 The recipe calls for Cheese Whiz, Fritos, Hamburger patty, onions, refried beans and toasted buns. So glad to know this. We are planning a trip to SA this summer so will definitely put it on the itinerary. Dude. I am SO making these! !!! Wow! Who doesn’t love a good burger. I am so amazed at the talent and creativity you possess. You really have a gift. You make those of us who don’t LOVE to cook want to cook. I can’t believe those last few words came out of my mouth. Yikes. This is over the top! I’m a sucker for anything with avocado. Can I laugh that you use fat free beans? I’d do the same thing though, so I’m laughing with you. A Tex-Mex burger. This looks fabulous. Hey! I think these hamburgers look GREAT! I think I’m going to try them this weekend! oooo! I can’t wait! I so miss EZ’s. I remember many “girls trips” eating there. EZ’s was headquartered in San Antonio and we ate there the last time we went south. I wonder if they are still open. Perhaps we should organize a “girls trip” to find out. That’s sad about the restaurant! I love potato chips or fritos on a deli sandwich, soI bet this is fabulous. It looks great! I’m glad they went out of business. How else would we get this recipe? 🙂 What a great play on the classic burger – I’m sure your adaption is quite close to the original. Grated cheese in the ground beef is always good. I’ll take a slice of onion though, please!